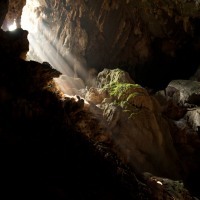 The New Zealand Herald wrote, "If teenagers ruled the world, it might resemble Vang Vieng". I cannot think of a more accurate phrase to put it short. 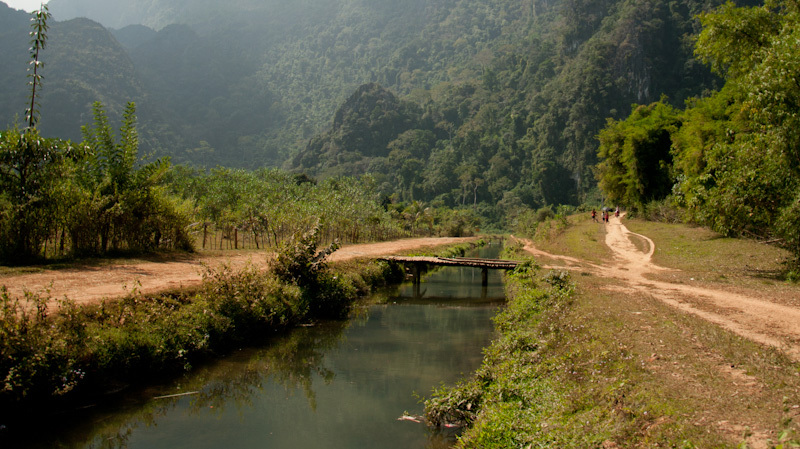 Vang Vieng used to be a calm, picturesque Lao village situated on the Nam Song river. Some distant limestone peaks fade away gently behind the river in ever denser fog, while those located just nearby set unique ambience. Western tourists long ago realized Vang Vieng has some potential, thus contributed to gradually transforming it into the ultimate manifestation of freedom and craziness. 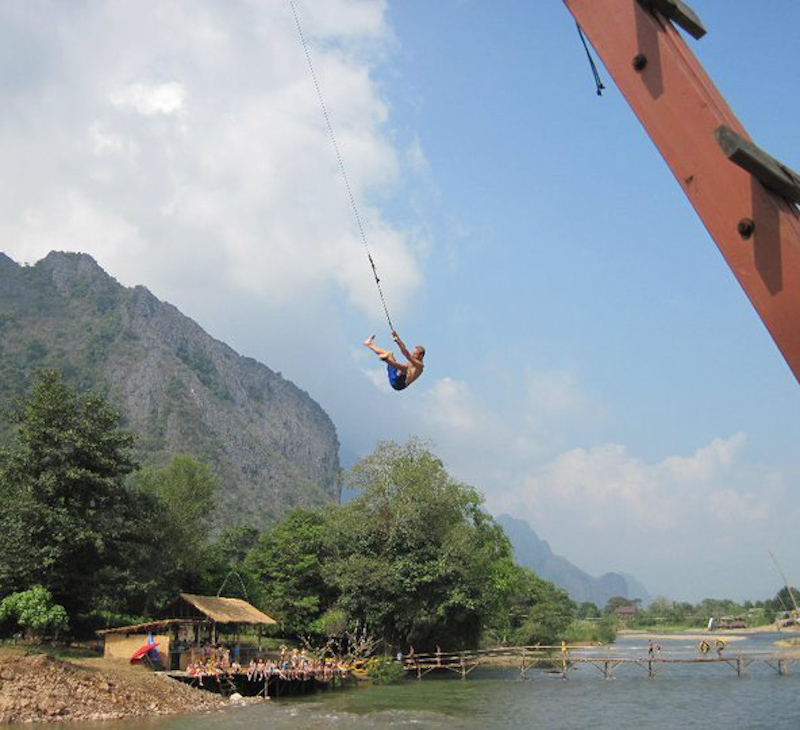 The famous throughout Asia Tubing is with no doubt the main attraction of Vang Vieng. In short, the idea is that you sign up in the morning, then you get a large inflated inner tube and a tuk-tuk driver takes you upstream. Your goal is to use the entire day to float a few kilometers downstream. Sounds like a plain sailing, but it is nearly impossible to complete before dusk. If you do, it means you haven’t had enough fun! Bars are located roughly every hundred meters and at each bar you get free lao-lao shots, a whisky-bucket, cold beers, loud music, waterslides, guys and girls painting each others skin, mud volleyball, crazy contests and giant swings on the river. While in Europe there is zero percent chance that such place would ever exist due to some regulations, any of such rules or safety concerns are inexistent here. It’s really amazing to see words “make sure you buy a drink before you swing" and then climb upstairs a shaky bamboo makeshift structure. Standing unsecured about six meters above the rocky waterfront, I just lean forward to grab a bar of a swing and within two seconds I am already flying several meters above the river. I asked a bartender for a tip –“In general it is safe, however try to plunge more or less HERE at exactly this point, because elsewhere due to low water level the river might be too shallow, besides, the bottom varies every day". Well, yes! The party atmosphere comes steps. At the beginning of each day all tubers timidly approach riverside bars. Reflecting that jumping into an unknown river from a height of several floors would be a suicidal madness, they drink beer, moonshine lao-lao, whiskey and play in the riverside bars instead. Over time some first daredevils appear and once everyone is drunk enough, no one pays any attention for safety anymore. It doesn’t matter, a little swing, which seemed to be too dangerous in the first bar, even if several bars downstream it is already three times bigger, now it does not raise even slightest suspicion! Does anyone control it? Nobody. Accidents happen and every month a few innocent tubers die. Everything here is readily available. A few days ago I lost my board shorts I bought in Madrid. The ones I bought here are nearly the same, except for the ten times cheaper price! It is not only low-cost semi-original products that are easily available. Party all the time with no limits until you blackout is just an introduction. Bucket Bar, free shots, free whiskey buckets, total endless craze, which still continues, although no one has any more energy left. The following day party starts again and it is everyday. In fact, Vang Vieng does not know a word limit. So limit is where you set it yourself. Different visitors have different limits. While some like to go out and party, others may go for a hashish desserts, opium cocktails, hallucinogenic pizzas and indeed all items on a menu for a small fee can be turned special or happy. To ask is enough. I appreciate freedom, but I prefer to enjoy it in different ways. Tubing is an interesting phenomenon, but the river can be also used for canoeing or accessing hidden caves. 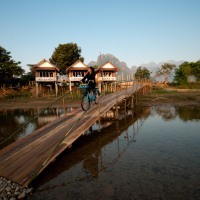 The area around Vang Vieng is interesting to explore on a bike or a bicycle. Gravel roads lead to different locations such as a blue cleft-like lagoon, various caves or rocks for climbing. 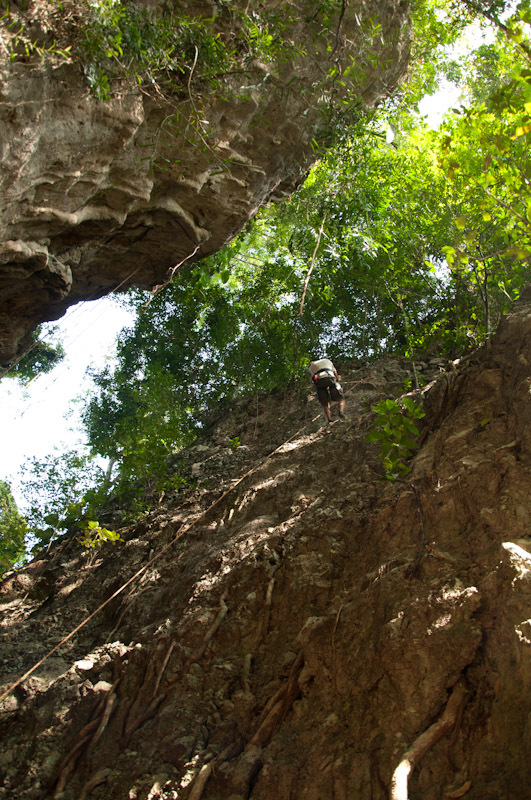 Walking inside caves sometimes requires crawling on your elbows along mucky mud. The caves are dark and, as anything else around, have no safety provisions. 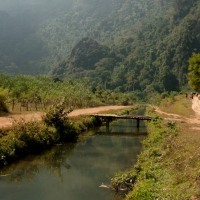 It is the hidden charm of Vang Vieng. 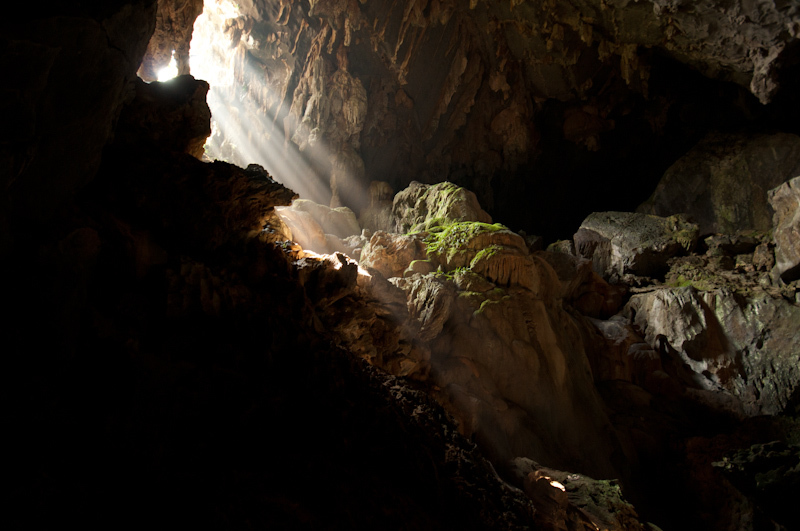 You have to be careful, for example visiting Phakham cave it is fairly easy to make an unnecessary step and fall inside a huge, several meters deep hole. 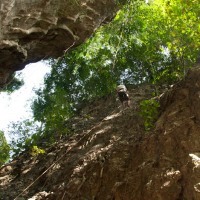 Climbing in Vang Vieng, according to people I met is even better than the famous Krabi in Thailand. I get to know Yves, an adventurous Dutch guy. We spend the entire day together climbing and belaying in turns. We try our skills at various walls reaching up to 25 meters. The difficulty levels are various, we start from 5a-, then progress to 5b, 5c, 6a. With an enormous effort I climb 6a+. 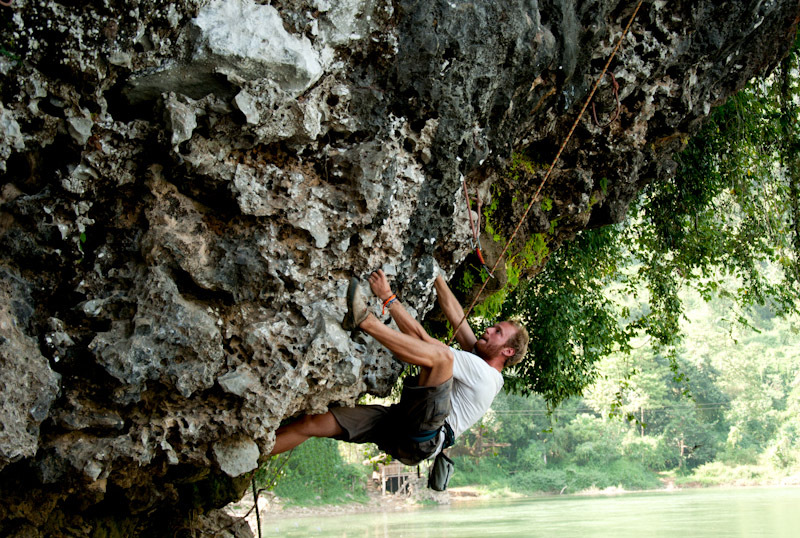 The next one I try is a 6c route overhanging the Nam Song river. I make three major attempts and I fall off three times. No chance of climbing this one. ….and it was Yves who made me go tubing again. Vang Vieng is one of those places where even planning to pass it you decide to stay for a day and in the optimistic scenario you end up staying here three or five days. 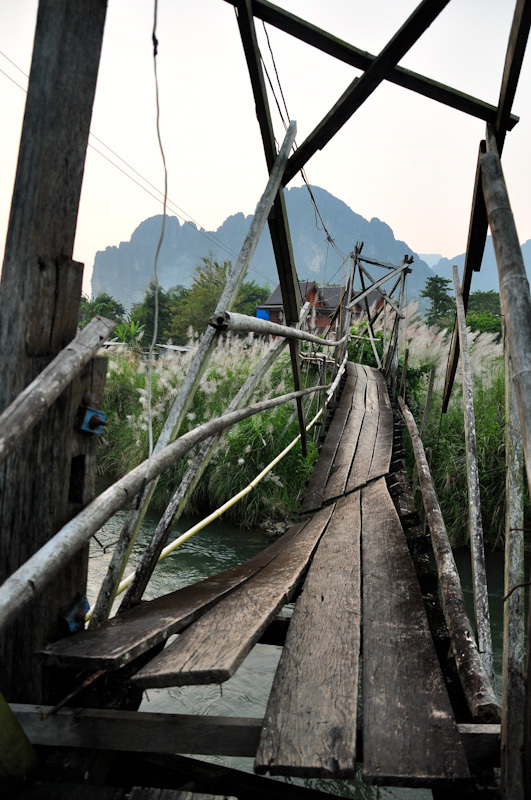 Actually I met some travelers who have overstayed a bit and never left Vang Vieng for more than six months. After all, it is the capital of craziness to an extent which has never been known before!